The role that interest groups play in the formation of government policy agendas. The lobbying strategies used by welfare advocacy groups to influence welfare state outcomes. The relationship between the welfare sector and other key lobby groups and political parties. The impact of key contemporary influences such as neo-liberalism and economic globalization which have arguably transformed the political context within which welfare advocacy groups operate. 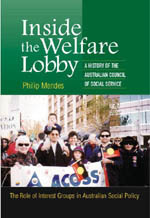 Philip Mendes has written an important book about an important organisation. The debate about fairness in Australia has been hijacked by the Coalition and their army of supporters in the right-wing think tanks and sections of the media. ACOSS helps to reframe that debate. In our common quest to make Australia a fairer and more prosperous country, Mendes's book reminds us of the importance of a strong voice for the most vulnerable. This book helps to fill an acute shortage in academic writing about the major interest groups that play such a large role in Australian policy-making and politics. ACOSS stands alongside the BCA, the ACTU, the NFF and other large peak organisations; without an understanding of ACOSS our knowledge of contemporary politics is incomplete. In particular, ACOSS’ role in welfare politics is central. Mendes has the best credentials of anyone I know to write such a book. His knowledge of ACOSS is up to date and detailed. This book will be a major resource for all university courses in contemporary Australian politics and a necessary guide for all informed political commentators. Philip Mendes offers us a study of how ACOSS has built and developed its messages along with its tactics in seeking to influence policy to tackle poverty. Politicians, organisations, and researchers will all find something of interest in this examination of the case of the ACOSS and its relation to the policy making process. By studying the organisation, tensions in its role and its ability to adapt to its circumstances, alongside evaluating its successes, both around agenda setting and specific policy change to improve the position of those most disadvantaged in society, Mendes gives us not only a view into the ‘black box’ of policy change but an example of the strengths and weaknesses of campaigning organisations and of how their success can be judged.